Wiring Hardware >> Tangible computing >> The Big RGB Leds matrix tests post. Title: The Big RGB Leds matrix tests post. I post this new thread in order to clarify some questions. The main problem in driving a RGB Led matrix isn't the hardware, but the code for a lot of us. I mean: Arduino or Wiring, or ... no problem with them.. But the code you run is the problematic point. I did some basics tests with a particular rigour in building, verifying, evaluating. I decided to test 3 libraries: LedControl, Matrix() and a code for max72xx (I named this last one like that further.. but it is "only" a piece of code useable with the max72xx). Code for max72xx works fine. Code for max72xx works fine => the code isn't make for that. LedControl and Matrix() and Code for max72xx doesn't work fine. when I power on a single color of a particular led, this particular led is ok BUT on the same column, all the others leds blink with the color driven on the right first led. I guess it is THE DIG's sharing problem. I made a very basic test: I shutdown the second max when I want to power on the color driven by the first max. It is a crappy code but .. it works: no blinking strange effects on the columns etc. a lot of posts on the arduino forums seem to describe this problem. It is caused by the lines sharing between the maxs. It involves an Interrupt Sub Routine that acts each time a modification is made on the matrix. There is a cyclically power on and down explains here: http://www.maxim-ic.com/appnotes.cfm/appnote_number/1004 and Multiplexing MAX72xx. But this code doesn't work with Wiring Board! There is a library problem. In the mstimer2, it is written: "works only with Atmel168"
Wiring is an Atmel128 based board. Does someone could? Did someone do that ? if someone could hack the mstimer2 : I'm sure it could be a useful playground on this site, cause i'm not the only one who want to do that. Title: Re: The Big RGB Leds matrix tests post. This code is an alteration of a code already existing. That WORKS FINE for 3x2 leds matrix and for 2 colors only! it only works for 2 colors ! But for 2 colors, great it works!! The MAX7221 is great for driving 7-segment LED's, but there may be a simpler way to do this. What about using a MCP23S17 and an MCP23S08 to drive the matrix as depicted? These are 16 bit and 8 bit SPI interface port expanders. The MCP23S17 could drive the columns and the MCP23S08 could drive the rows (via a ULN2803 low side driver, perhaps; since you have a common cathode arrangement). You would have to write your own code; but it should be fairly easy. N201LJ, you raise another idea with your post. it reminds me a guy wrote about i/o pins of the board. would it be possible to use them directly to control columns and rows? Sure - you could drive the columns directly with 16 digitals pins on the Wiring board, and the 8 row pins via a transistor array e.g. ULN2803. It would consume a lot of pins, though. I watched the ULN2803 datasheet. rows: 8 RGB leds = 8 cathodes = 8 pins? It could be nice to create a library to manage that. I mean: to have a more friendly code. 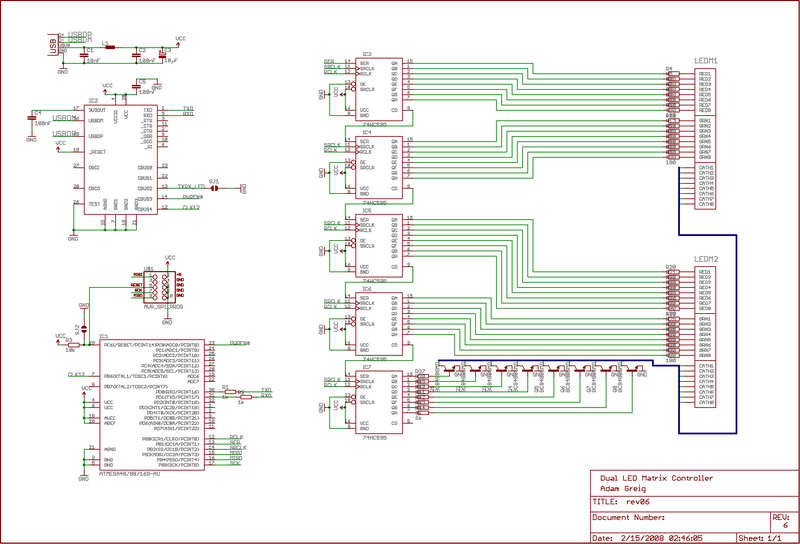 N201LJ, could you help me to draw a schematic? excepted the fact that there isn't MAX7221 (but 74HC595) and no Wiring board... Does the principle with the transistor array is the one you talked about ? it seems the transistors solution is THE solution for me. do you think performances could be fine? my last idea: only transistors! as the wiring board owns MANY digital pins, it could be nice to only use transistor. I guess it could work..
any suggestions, ideas, advices ? indeed it is very much. in this case, no cycling except if I want to reduce the power needed... Am I wrong? i didn't precise that there should be a cycle too. if I understand well, I'll have to cycle one led at a time on each line... because of the common cathode..
without cycling it would be impossible: on the second row transistor for ground commuted + the same in the third. so if in the second row / second column I want to power up, in all the columns with ground commuted on the row all leds will be on. so, May I have to cycle the row? the columns?